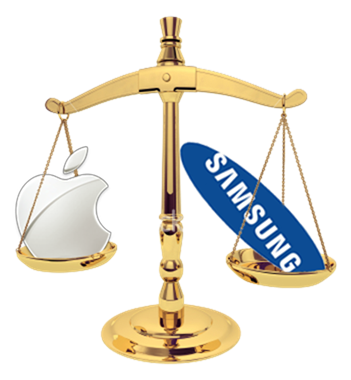 It was only yesterday when a United Kingdom based court of appeals took the decision to reprimand Apple for their failure to act in proper accordance with an original judgment in October that stated they must issue an apology to Samsung Electronics through their customer facing UK website. Although the company has removed the initial linked statement from their website and are yet to publish the new homepage based announcement, they have started publishing the notice in UK print publications. This morning’s Guardian newspaper contained a rather small advertisement containing a statement that has been ripped directly from the original linked copy that was tucked away on Apple’s website. In order to keep the judges happy, it has been ran with the comedic aspect of the commentary removed. 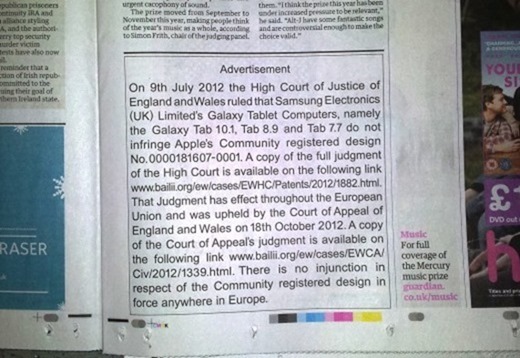 As well as stating that Samsung did not infringe on their community registered design, Apple has also taken the approach of pointing readers to the online home of the original legal judgment. It’s unknown how many publications are actually featuring the statement at the moment, but the same commentary has already been spotted in The Guardian as well as The Daily Mail. As part of the judgment in October, the iPhone and iPad maker was told to comply with the order and they would need to also run the statement in The Financial Times and that the print would be in a minimum sized font and displayed before page six of the publication. As part of the court of appeals ruling yesterday, the company was also ordered to place a statement on the homepage of their UK website rather than hiding it away in a linked location. In the 24-hours that have passed since the appeals ruling, Apple has taken action to remove the website statement, but at the time of writing, they hadn’t updated their homepage with the ruled request. With only one day left, we can only assume that Apple is intending on updating the Apple.com/UK website with the new information at any point, but we shall wait and see if they have any comedic tricks up their sleeve or just post a plain to-the-point apology like we are seeing in the print publications.